This energetic hologram is one of the most powerful hologram that exists so far. It can truly performs miracles. It contains all the vibrations of one of the most famous texts of Mahayana Buddhism. See here for introductory information. 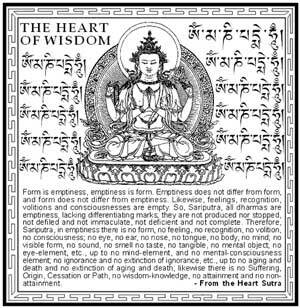 Interestingly, it turns out that the vibrations of this Heart Sutra hologram dissolve (among other uses that need to be discovered) karma and negative beliefs very easily and quickly. And when you dissolve karma and negative beliefs (also called counter-intention), you deeply change your life for the better and for ever. Just like the other holograms, you just need to touch the picture of the hologram and think about what you are about to transform. This hologram was recommended by my friend for a specific health issue with my right thumb and hand that has developed at work from what I believed was mechanical physical repetitive motions. Reminding me that all physical manifestations originate in energy, I considered the frustration and restlessness I have felt in my job and began experimenting with this hologram. I took a snapshot of the hologram with my phone and placed it on my opening screen. Imagine the many times you look at your phone in a day and each time connecting with the Radiant Sutra of the Heart. HA! Keep those Good LOVING Vibrations going, Raphael!